Providing you the best range of gynec examination couch with effective & timely delivery. Overall Size L 1830mm x W 575 mm x H 850 mmFrame CRCA Sheets and Rectangular tubes. •	3 Cabinets; 1 with lock, drawer with lock. 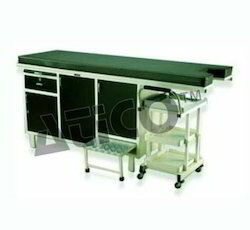 •	Examination Trolley with three traysso. Looking for Hospital Couch ?